My Sony tv that I have been using since August 2018 has continual problems when I am trying to watch programmes on All4 and also not so often problems with the bbc iplayer. When trying to watch the All4 programmes it often starts with an advert then sticks, I have to click back and then start again, this might work but sometimes I just have to give up with it. I have tried a few things, a soft restart, switching off and on the router, a factory reset, date and time on and off automatic, clearing the cache on youview. Not happening so much recently but also have issues with the tv losing the internet connection. Not if you have tried all those resets. But these are known issues with these sets, and the versions of players on them, which crop up time and again, and are usually amenable to at least one of the resets you have tried. I wouldn’t like to suggest that you buy a new TV of a different make; but I would suggest that you buy one of the Smart Sticks that are available for under £50, and use that for your Smarts instead, still benefitting from the excellent picture on these Sony TVs. 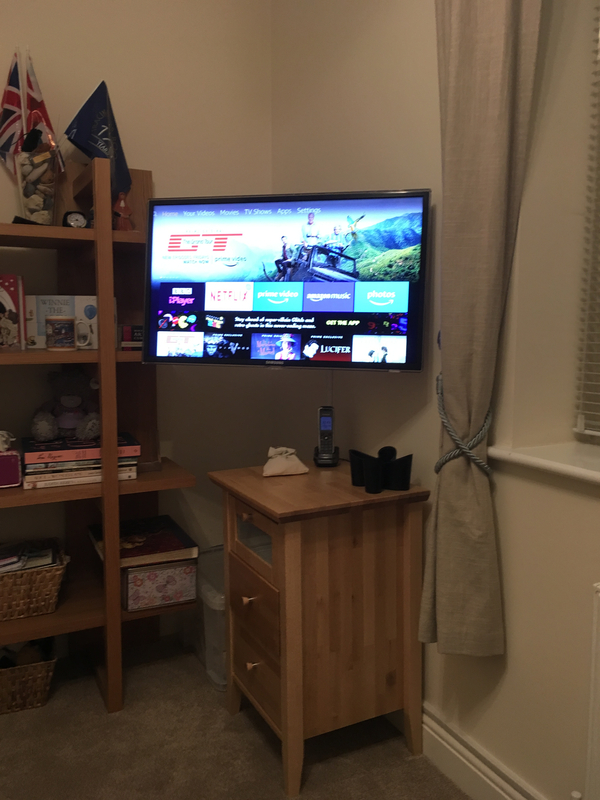 I moved into a new home and the previous owner had their tv set up on an otherwise blank wall - very tidy looking and now I have to have a wire hanging down the wall to a socket just to get my fix of All4 for another £30 to £50, not the outcome I was hoping for. It seems that gone are the days that you could just sit down put on the tv and watch! 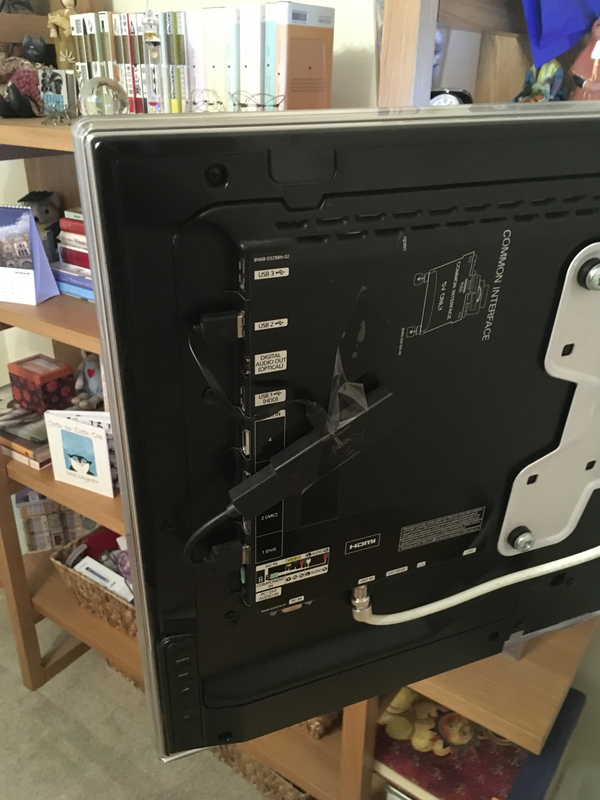 I got some advice over the weekend where it was suggested that I move my router into the room where the tv is (not practical) and the router currently is only app 8ft away from the tv set although signal passing through 2 walls. If I found that the signal was better to the tv with the router just about sitting on top of it then perhaps a booster is required or a better router. Any further advice that anyone can throw my way? Well, I would power the smart stick from one of the USB ports on the TV. But the second picture explains it. Though the trunking that carries the mains and the TV aerial cable to the set, on its 180 degree cantilever, anyway requires a pair of sharp eyes to spot it in the first picture; and I could get a couple more cables down it if I wished. As regards the internet, these Sony Android TVs are patchy here, and the patchiness extends to even Ethernet in some cases. But if you want to extend Ethernet through a couple of walls, and you don’t want to drill holes, then get a pair of Powerline Adaptors to route the Ethernet over your mains cables. I use a pair of these (where the remote one is also a WiFi repeater, though I suggest you wire both ends in your usage) to go from the house to the garden room where my study is, and it’s seamless. Thanks very much for your advice and the pictures. As I am not technically minded at all can I ask about the firestick as I have it plugged into my tv and the other end is plugged into a socket in the wall - is yours just plugged into your tv? Yes it is. Actually, if you look closely at what’s on the wall, you should see that it is a cube-shaped Amazon power supply, and the cable coming to the Firestick is actually detachable from that power supply, and has a full-size USB plug at the wall end, and a micro USB at the Firestick end. And I have plugged that cable (or possibly an equivalent, but shorter,one that I had lying about) into one of the USB sockets on the TV. This is fine for normal use, 5V 1A, though you may need the mains one, 5V 2A, temporarily, if the Firestick wants to update itself and the USB socket on the TV hasn’t got enough welly. But the Firestick will tell you, if/when it needs this extra power.